See also original VIP-2 plan location on their website! Powerful VIP-rates suitable for those who have outgrown a regular shared hosting but do not want to spend time on the VPS-server administration. More resources allocated and fast SSD drives provide stable operation of the loaded web project. 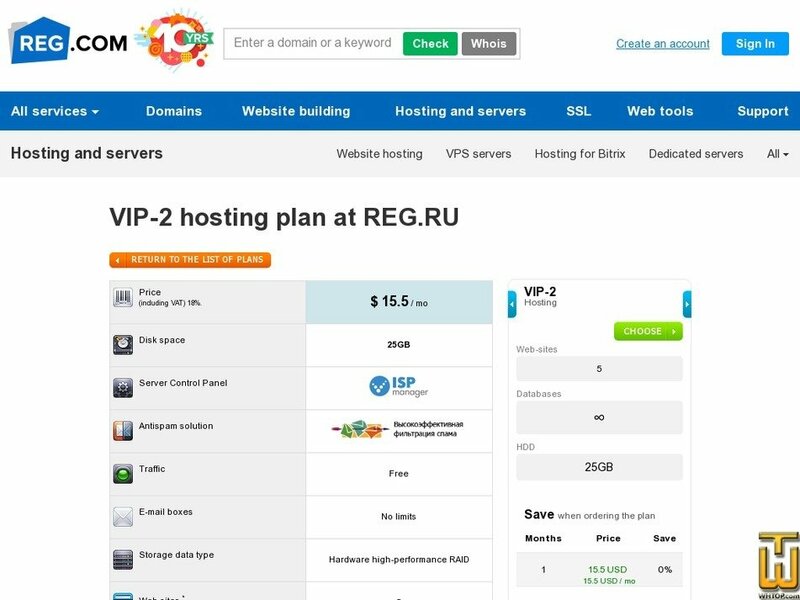 REG.RU is aware of reliable hosting importance for websites. This is precisely why the company uses only highly reliable and fail-over servers by well-known manufacturers in accordance with the latest requirements. Prices of paid website hosting depend on the selected tariff. REG.RU pricing plans are well-balanced, and the company warrants provision of the declared resources. The price is for 36 months’ payment. Including VAT 18%.